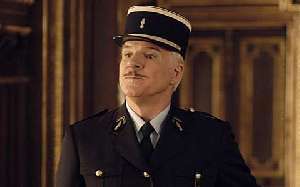 Cast: Steve Martin, Kevin Kline, Jean Reno, Emily Mortimer, Beyonce Knowles. Story: A modern remake of the bumbling Clouseau movies. If you even know who Peter Sellers is, stop reading now and go and watch something else. The Pink Panther is a travesty - but if you're new to it, it may help you discover a classic. Let's face it, everyone's expecting this movie to be crap. And, in complete honesty, it is. It's an awful, awful movie - but in a way, that's deliberate. Looking back, the original Peter Sellers Pink Panther movies were terrible affairs - but due to Sellers' comic genius, they were somehow fantastic at the same time. The problem with this new movie is that it goes to great pains to reproduce all the crap cheesey bits and completely fails to recapture the magic. Steve Martin is undoubtedly a very talented man, as The Man With Two Brains proved, but his movie selection skills are abominable. Cheaper by the Dozen 2 was almost infeasibly awful - if it wasn't for the occasional gem such as Shopgirl, I'd have written him off as a has-been with a broken camshaft and four flat tyres and, true to form, he wholly and spectacularly fails to fill the shoes of his predecessor in a movie that seems on the face of it to be the least advisable remake in the history of cinema. And his new catchphrase - "Good one" - has to be the worst catchphrase I've ever heard. Once was too often. Credit where credit's due though, The Pink Panther is not a complete disaster. 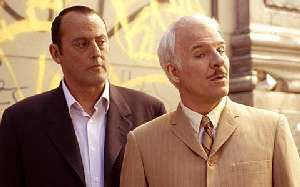 Some of the slapstick succeeds in raising a titter and the soundproof booth scene (which you may have seen on the trailer) is genuinely amusing, but the problem still remains - the original Pink Panther movies were low-brow crap brought to life by an on-form Sellers. The new movie is just low-brow crap. I have to point a wagging finger at Jean Reno's agent - what have you done to this poor man? After Léon (a.k.a. The Professional) - one of the best movies ever made - Jean Reno was possibly the coolest actor on the planet. Then what happened? Godzilla - oh dear. Ronin - oh good, is he coming back into the cool? Er, no, because next on the grocery-funders was Just Visiting - oh dear god. Then, a bleak period, and I suppose we all have to make a living, hence he's prostituting himself in The Pink Panther. It's as if the director is mocking him, making him dance for the camera (literally, in one excruciating scene). Let's face it, Reno is a magnificent cool cat, but he's no comedian. He, as with every single person in this movie, is massively miscast. Kevin Kline was fabulous in A Fish Called Wanda, but he's dreadful here as Inspector Dreyfuss. Emily Mortimer was excellent in Young Adam, but is clearly the wrong person to play the whimsical French secretary. And Steve Martin. Well, he tries. My, how he tries. At least they kept the animated opening credits with Mancini's classic score. The Pink Panther is not even close to capturing the magic of the original series. However, if you're young enough to see it as a fresh canvas, you're likely to find enough to make you laugh, and with a bit of luck it'll encourage you to check out the Peter Sellers classics - and if you do, this movie won't have been a total waste. I enjoyed this film: 2/5 - not the complete fiasco I was expecting. Close, though. I think the average moviegoer will enjoy it: 1/5 for fans of the original - 4/5 for those too young too have seen them. Testosterone Satisfaction Rating: 0/5 - farting is as naughty as it gets. To enjoy this film you should be: new to Clouseau. Or very drunk. The Pink Panther is released in the UK on 17th March.